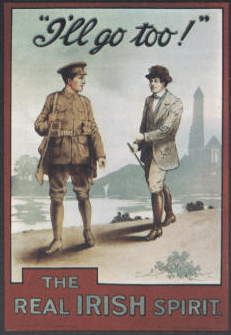 Richardson’s research sometimes brought him face to face with what I used to call the “Poor Paddy” myths which were common among republican relatives of First World War soldiers in Cork. The two main ones were: (a) “Poor Paddy was an underage soldier” — when in fact he had joined up as an adult: (b) “Poor Paddy was conscripted” — when, of course, conscription was never introduced. But Richardson adds a third that is totally new to me — the myth that “Poor Paddy” died while fighting in the Irish Army! Richardson dryly notes that whenever he delicately pointed out that since the Irish Army did not exist their relative must have died in an Irish regiment of the British army “the mood of the conversation quickly changed”. Written by: Eoinpurcell on 18 October, 2010.on 22 October, 2010.